KitMonsters – Boss Metalzone MT-2. The music makers’ guide to making music. 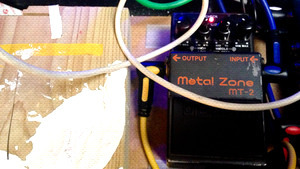 A metal favourite and the secret weapon of many an indie, and even electronic band, the MT-2 maxes out that metal sound, with plenty of distortion. It’s one of Boss’ most popular pedals - huge and wild. It gives you super-long sustain and heavy mids and lows like a stack of overdriven amps. The three-band EQ with semi-parametric Mid control offers a wide range of extreme distortion textures.